Bring antique style to your bird garden with this Heartwood Blue Vintage Wren House. The striking blue tone of this rustic shelter perfectly contrasts your foliage, while its multicolored, shingled roof adds an exciting hint. A 1.25" diameter entry hole is great for small songbirds, and it sits in a recessed panel with an asymmetrical frame for unique style. This mimics crevices found in trees, and the distressed finish furthers the natural and aged look. A pitched, shingled roof protects the nest area from rain, while gaps beneath its overhanging sides help ventilate the piece. Drainage on the base prevents water from accumulating in the chamber, and a back cleanout panel aids in monitoring the shelter. Use the attached hardware here to place the home against a wall, or add a mounting plate (not included) to the base to rest it on a pole. The wood construction creates a lasting abode, and its copper roof ridge ages beautifully for a classic look. 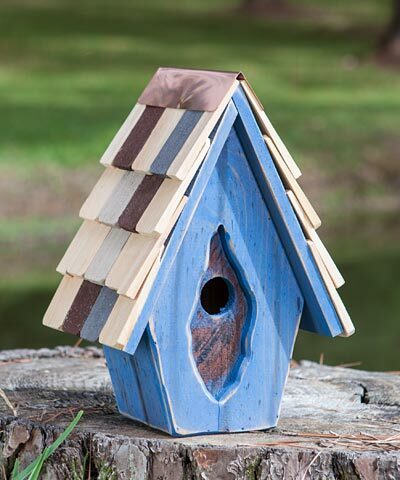 Invite your feathered friends to live in timeless style by placing this Blue Vintage Wren House in your yard. Made in the USA.